The Sennheiser 600 Series Band Kit is a reliable and cost-effective drum microphone package for recording and live sound reinforcement alike. 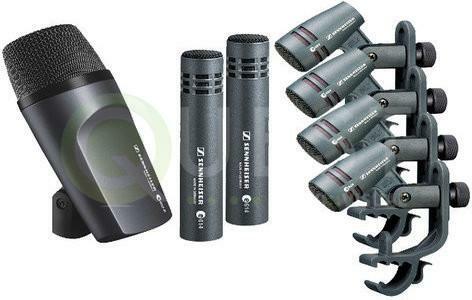 The package includes a Sennheiser e602 dynamic kick drum microphone, four e604 cardioid tom/snare microphones, and a pair of e614 supercardioid overhead microphones. The microphones and their associated hardware are all shipped in a slim-line aluminum case with die-cut foam.